In the tenth pAsuram, AzhwAr says “Until he attained me, he mercifully remained in thirukkadiththAnam; once he united with me, he is standing and sitting in my heart”. emperumAn who is with (enjoyable) amazing activities, who is having the apt relationship, who is the one who eliminates the hurdles to experience him, and who is the one who comes as a seeker and gives enjoyment, is residing in my heart, fitting well there; he is standing in thirukkadiththAnam which is having garden filled with kalpaka trees and vaidhikas who are having the greatness of being ananya prayOjana and who stand and chant four vEdhams loudly. nArAyaNan – vathsala (one with motherly forbearance) who will not give up his belongings [emperumAn is related to everyone, is the support for everyone and is the antharyAmi of everyone – this is indicated by the name nArAyaNa]. ari – one who is capable of eliminating the hurdles. 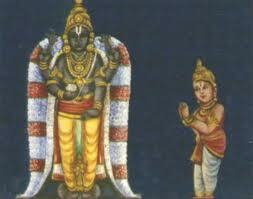 vAmanan – one who will minimize himself to fulfil all the desires of his devotees. aRpudhan – due to these aspects, he is amazing. nal pugazh … – First explanation – AzhwAr is standing in thirukkadiththAnam which is having kalpaka tree forest which resounds with the four vEdhams chanted by vaidhikas who are ananya prayOjanas, and further, he is seated in my heart; alternative explanation – emperumAn who is nArAyaNan, ari, vAmanan and aRpudhan who is from thirukkadiththAnam, is standing and fittingly residing in my heart. This entry was posted in thiruvAimozhi, thiruvAimozhi 8th centum on April 9, 2019 by Sarathy Thothathri.